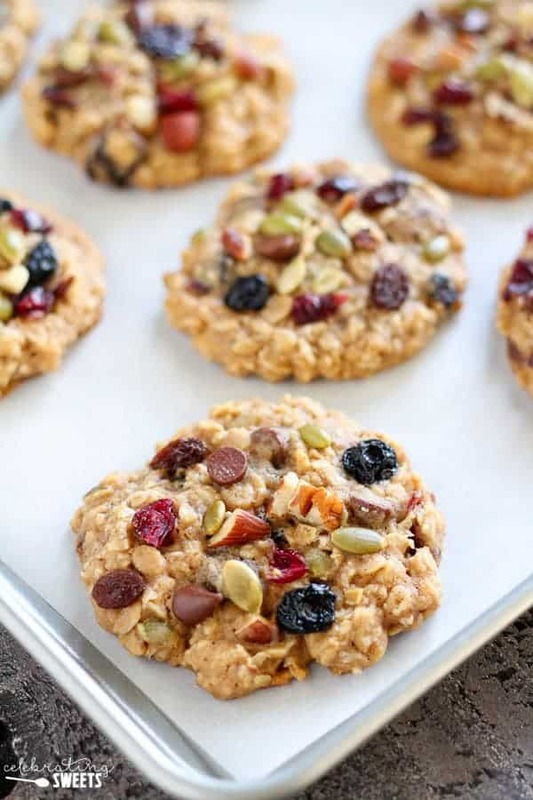 Healthy Oatmeal Cookies that are soft and chewy, sweetened with honey, and filled with your favorite trail mix. A wholesome and delicious treat for lunchboxes, snacking, or dessert. Today I’m sharing a recipe for a classic cookie with a delicious twist – Oatmeal Trail Mix Cookies. 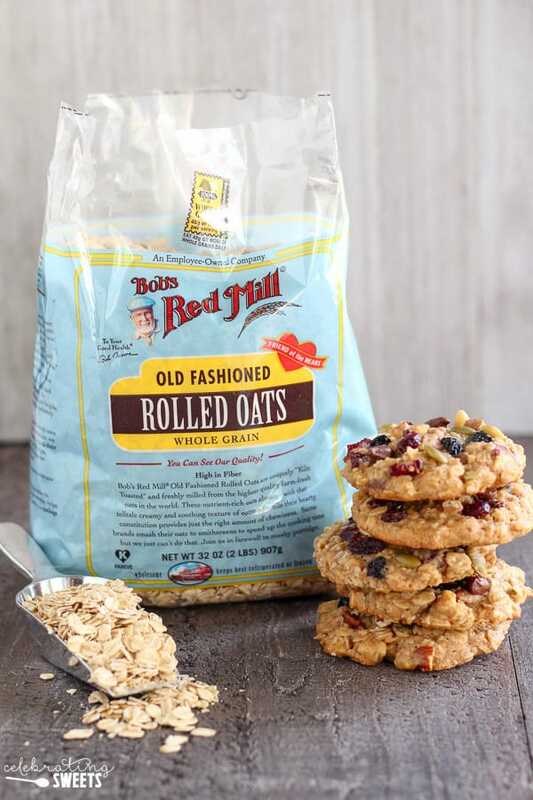 These cookies are soft and chewy, sweetened with brown sugar and honey, filled with your favorite trail mix, and loaded with Bob’s Red Mill Old Fashioned Rolled Oats. Cookie perfection is coming your way! I created this recipe because I wanted a snack/treat for my kids that was both delicious and wholesome. With the back to school season in high gear I’m always on the lookout for lunch box snacks, after school treats, or quick grab and go breakfasts for this busy time of year. 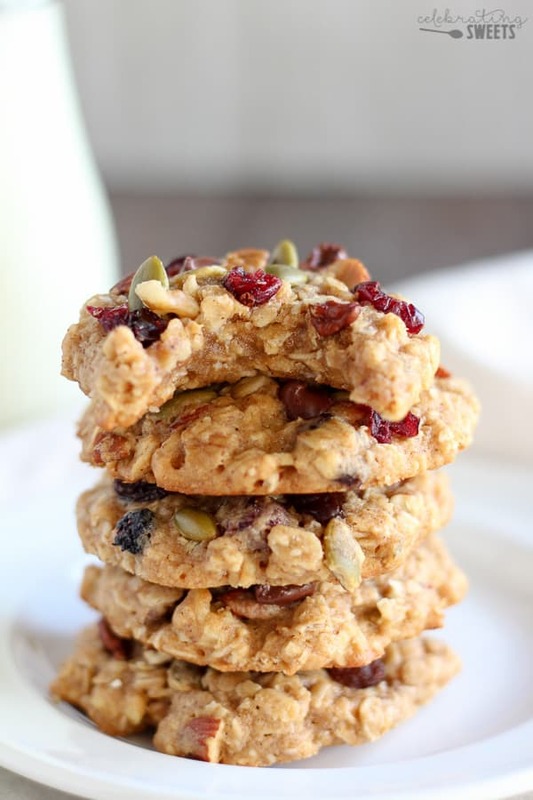 My family loves trail mix, so I decided to take our favorite trail mix and add it to oatmeal cookies. In an effort to make these cookies a little more nutritious I used white whole wheat flour, I swapped some of the refined sugar for honey, and I used my favorite Old Fashioned Rolled Oats from Bob’s Red Mill. Oats are an incredibly versatile whole grain; they are rich in dietary fiber and can help reduce cholesterol. 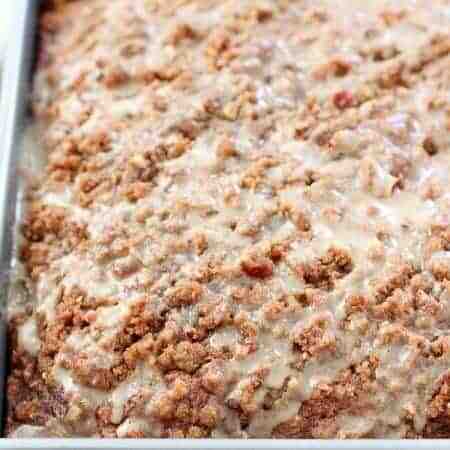 My family loves oats in any recipe – Overnight Oats, Granola, Baked Oatmeal – they devour it all. 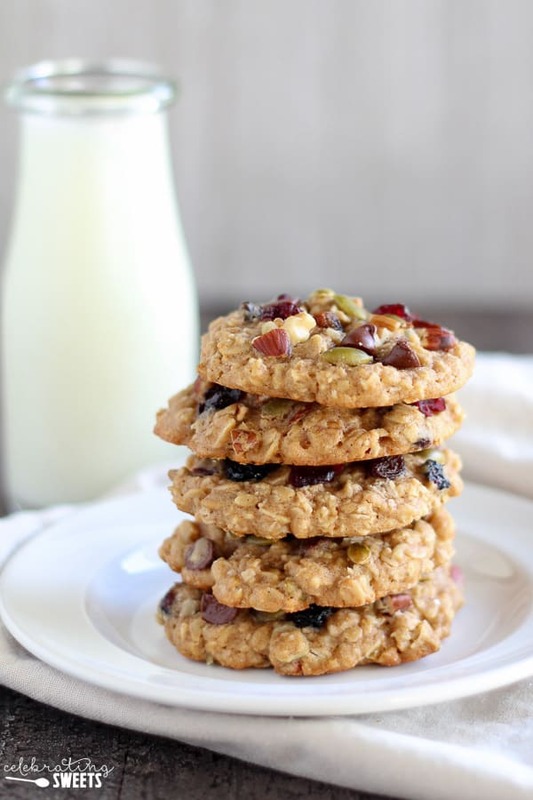 Although if I’m being completely honest, my kids would definitely say that these cookies rank as their favorite way to eat oats. 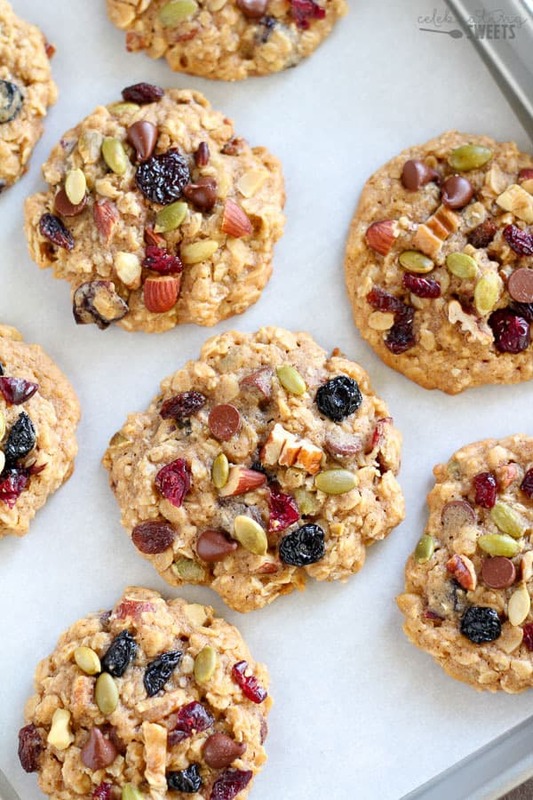 I call these cookies “healthy”, because they are more wholesome than a traditional cookie. 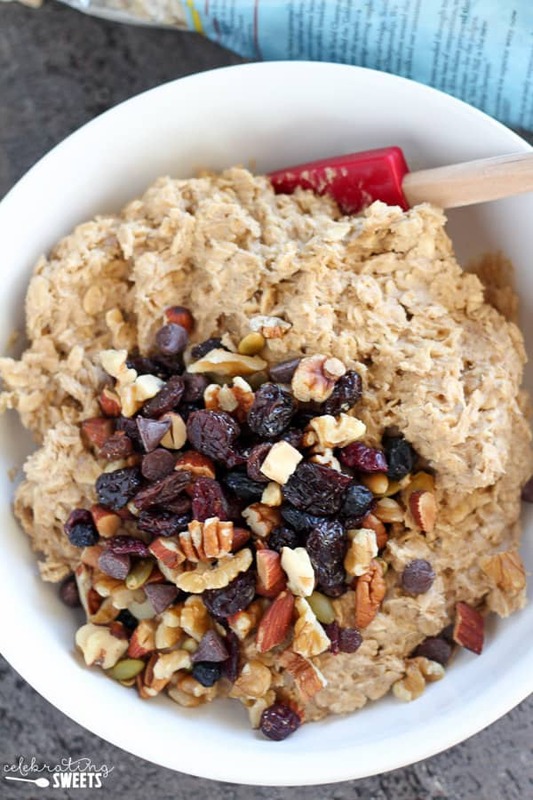 In addition to oats, they also include whole wheat flour, honey, nuts, seeds and dried fruit. If you have children that you’re sending off to school they would be thrilled to find one of these cookies in their lunchbox. My son, Jake, is ecstatic when I surprise him with an occasional treat in his lunch. These cookies also make a great after school snack for welcoming your little ones home from school. Or wait until after dinner and share a plate of cookies as a family (adults love these too!). They are perfect anytime, anywhere! Tip: These cookies keep well for several days. Make a batch at the beginning of the week and enjoy them in the days ahead. With a hand mixer or stand mixer, beat butter, brown sugar and honey for 2-3 minutes, until smooth and creamy. Add egg and vanilla and beat to combine. In a separate bowl, combine oats, flour, baking powder, salt and cinnamon. Add the dry ingredients to the wet ingredients and mix until combined. Stir in 1 cup of trail mix by hand. Cover the dough and refrigerate for two hours or up to overnight (you can skip this step and bake immediately, but I prefer the final texture after chilling). Preheat oven to 350°F. Line two baking sheets with parchment paper or silicone liners. Scoop the dough into two tablespoon balls and place a couple inches apart on the baking sheets. 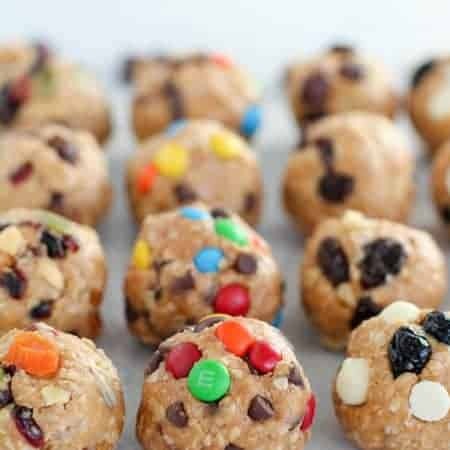 Use the remaining 1/2 cup trail mix to press some pieces onto the top of each dough ball (this makes the trail mix more visible and makes for a prettier cookie). Lightly press down on the dough balls to flatten just slightly. Bake for 9-11 minutes (see note), until the edges of the cookies are done and the very center is still slightly underdone. Do not over bake, as they will finish cooking on the baking sheet. Place the baking sheets on wire racks and allow the cookies to cool completely. Trail mix: You can use a store bought variety or you can make your own by combining nuts, seeds, dried fruit and/or chocolate chips. 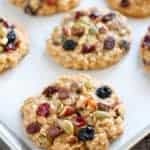 The combination I like best for these cookies is a mixture of pecans, walnuts, almonds, pepitas, dried cranberries, raisins, and chocolate chips. Bake time: If using less than 2 tablespoon dough balls, lower baking time by a couple of minutes. The center of the cookies should look slightly underdone when you pull them from the oven. Do you have any nutritional information on these cookies? They look really good and I would like to try them but I don’t want to purchase ingredients without knowing the calories count! Hello! These look amazing! Do you have a recipe of the trail mix you like to use? Thanks! Hi, Laura. The combination I like best for these cookies is a mixture of pecans, walnuts, almonds, pepitas, dried cranberries, raisins, and chocolate chips. No specific measurements of each ingredient, as I usually just throw together whatever odds and ends I have. It is really personal preference. Thanks for stopping by! I just love this recipe and make these cookies frequently. They’re great for throwing in my backpack as a energizing and luxurious hiking snack. I think that they are improved on by doubling the cinnamon, adding a 1/4 tsp of orange extract, and sprinkling the top of the ready-to-bake cookies with a pinch of coarse salt. I also just mix the whole cup-and-a-half of trail mix into the dough. These are super quick and easy to prepare, fairly healthy, and extremely satisfying in flavor. Give them a try! Hi, Justine. That’s great to hear. Thanks for sharing your adaptations, and thanks for stopping by! 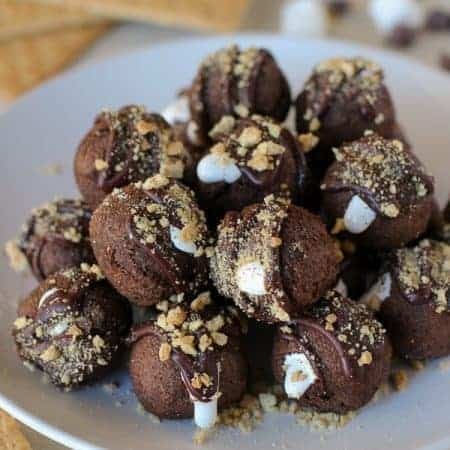 These were delicious and just the recipe I was looking for a hike and picnic. They turned out great and everyone loved them. I will make these again!! Thank you for the recipe. Awesome! Thanks for taking the time to stop by! These cookies turned out great! In an effort to make them healthier, I omitted the butter and instead used 58 grams of coconut oil and 58 grams of applesauce, and they still had a really nice consistency. I also omitted the honey, which cut down a bit on the sugar content. That sounds great! I’m glad it worked out for you. Thanks for stopping by!